This collection of essays challenges preconceptions about Marlowe by tackling major aspects of his dramaturgy, his use of magic, the homoeroticism of the plays, his female characters, twentieth-century performances of his plays, and the radical nature of his narrative poem Hero and Leander. 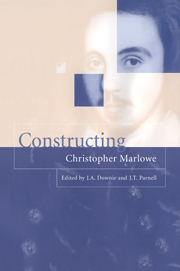 Taking nothing on trust, the authors review what is known about Marlowe's life and plays, conditions in Elizabethan theater, and his reputation among his contemporaries and among late-twentieth-century critics. Together they contribute to the critical effort to construct a fuller understanding of the poet and playwright. List of illustrations; List of contributors; Editors' note; List of abbreviations; Introduction J. T. Parnell; 1. Marlowe: facts and fictions J. A. Downie; 2. Marlowe and the Rose Julian M. C. Bowsher; 3. Marlowe and the editors Richard Proudfoot; 4. Marlowe and the metaphysics of magicians Gareth Roberts; 5. Marlowe's 'theatre of cruelty' Janet Clare; 6. Marlowe onstage: the deaths of the author Lois Potter; 7. A bit of ruff: criticism, fantasy, Marlowe Simon Shepherd; 8. 'Writ in blood': Marlowe and the new historicists Richard Wilson; 9. Hero and Leander: the arbitrariness of desire Claude J. Summers; 10. Gender and voice in Hero and Leander Georgia E. Brown; 11. Marlowe's politic women Joanna Gibbs; 12. Edward II, Derek Jarman, and the state of English Lawrence Normand; Notes; Select bibliography of works cited; Index.